I tend to keep these posts as short as possible, but today’s a settle-in-and-get-to-know-my guest kind of day. 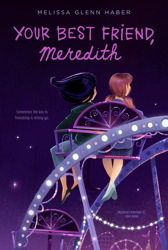 Melissa Glenn Haber agreed to answer some questions on the occasion of the paperback release of Your Best Friend, Meredith (the novel formerly known, in hardcover release, as Dear Anajali). Melissa is the person you WISH you got seated next to at a dinner party. Her insights and wisdom may jump right off the screen and settle in your lap. Was Dear Anjali/Your Best Friend, Meredith a hard book to write? Did you set out knowing this would be an epistolary novel about a girl whose best friend died before you started writing? Let me answer the planning question first. I didn’t really plan anything about this novel—it started writing itself in my head one day when I walked past a makeshift memorial. Dear Anjali, I hate that you’re dead, I started, and then the voice that became my main character started pouring out of me: if the universe was the way it should be I should not be able to write those words the letters would refuse to print on the page they would REBEL because it does not make sense it is senseless NONSENSE that my best friend is suddenly and totally dead!!! I didn’t know where I was going in the first week of writing, except Meredith’s voice and that Anjali had suddenly died. I write both fantasy and straight fiction, so for a while there I wasn’t even sure if Anjali was going to write back. But as the first couple of letters came out and it became clear that both Anjali and Meredith had liked the same boy, I realized that the book was becoming something quite different from what I had thought it was about. It is of course a book about death and grief (and, I think, ends with an idea I find very comforting about loss), but in the end the main focus of the book is about the less extreme changes that happen in friendships. Probably the most important letter I ever got from a reader was from a mother who said that her daughter had found sympathy and solace in the book not because she had had a friend who was dead, but because she had a friend who had dropped her like a hot potato. So no, I had no idea where the book was going in the beginning. Of course, I probably should have known it was going to be about friendship, since all my books are. I’ve written about spy games that turn out to be true and wars between dragons and monsters and about three-inch-tall boys who need to save mice from the depredations of rats, but as my husband likes to say, they’re all about the redemptive nature of friendship. Part of the reason the book took form so quickly was that it was incredibly fun to write. For one, I needed to add a lot of levity to such a grave (so to speak) topic, so the book ended up being much funnier than I expected, and that was very gratifying. Secondly, it was a lot of fun to write about both friend-love and first romantic love, for the simple fact that all intense experiences are a thrill. Sometimes I think I write for 10-15 year-olds because early adolescents are like the super-tasters of emotions. Sometimes I miss that intensity; I got to relieve it with Meredith. In your bio, you talk about some “friendless years” in your childhood. Did books play a big role in your life then? Did you have a favorite literary character when you were a young reader? What did you think of the friendships you read about? I always tell kids that a friendless childhood is superior training for being a writer, not only because it gives you a lot to write about, but also because it gives you plenty of time to read. I read all the time. My favorite writers in those days were Madeleine L’Engle, the under-remembered Marilyn Sachs, and Tolkein. I did love books that had tight relationships in them—I loved those parts in Helm’s Deep when Legolas and Gimli finally became friends—and I felt in my bones that I alone in the universe understood the importance of Meg Murray standing in front of IT and loving Charles Wallace. But when I think about it now I realize my favorite characters were often not the people I thought I could be or those I wanted as companions, but the hero/protector figures like Gandalf and Aragorn or Hazel in Watership Down or the older brother in Astrid Lingren’s The Brothers Lionheart, (the one who was willing to risk saving his enemies even if he got caught, because then they’d catch a lionheart and not a piece of filth). I still like those characters; my favorite Harry Potter characters are Lupin and Sirius. 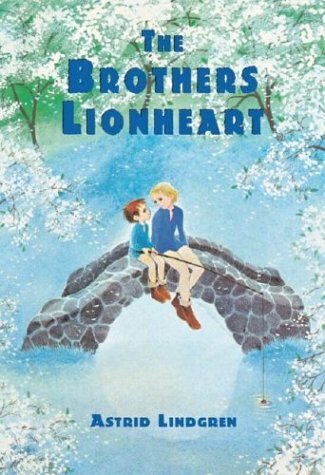 I should say though that though I loved books and the characters in them I was lucky enough that I didn’t need them to tell me about friendship. Before my terrible friend drought, I had a best friend. Her name was Kathy Witherspoon and she moved to Richmond, VA when I was eight, and I lost track of her a few years later. Every now and then, like this, I try to throw her name into the void to see if she’s still out there, so she can know how often I still think of her and how grateful I am that she was my friend (and let me play with all Barbies and all their shoes). If you could pick a fictional character to move into the house next door to Meredith, who would you pick and why? What an interesting question! That underappreciated Marilyn Sachs wrote a book called A December Tale about a girl who’s so sad and abused by her foster parents that she’s driven to a fantasy world where she’s best friends with Joan of Arc. I think I’d choose her to live next to Meredith, so that Meredith could save her; it would be good for both of them. I haven’t read that book in thirty years, but I still ache for that poor unhappy protagonist—and for Marilyn Sachs, who wrote such a nearly perfect book that isn’t getting read the way it deserves! Friends play a really central role in my life but not as much in my writing life; I tend not to share manuscripts until pretty far along. I don’t know why. For years it was because I was too scared. I went a good 18-year stretch where only two other people ever read anything I wrote. (I’ve learned my craft on my own and at the hands of really extraordinary editors—I’ve never taken a writing class or had a critique group.) Now that I actually enjoy getting criticism on manuscripts (though not on books, when it’s too late to do anything about it!) I don’t know why I don’t get more feedback from my friends—I think it’s in part because none of us has enough time to read. Sigh. If you could talk directly to Meredith, what would you tell her? If I could talk to Meredith… it would be a disaster. I can see it now. I know I’d get all maternal on her—that is to say, I’d criticize her, telling her to sit up straight and wash her face. But that would only be because I couldn’t tell her what I really wanted to say, which was just what Glinda wanted to tell Dorothy back when her house had just squished the witch: you have all the power you need, with those ruby shoes of yours. But the great profound message of The Wizard of Oz—and the truest thing I’ve learned in my 42 years—is that the fundamental truths are the ones you can’t believe until you’re on the other side. When I was a kid one of my treasured possessions was a book signed by Madeleine L’Engle to my grandmother. In the dedication, my favorite author quoted from the 14th century mystic Julian of Norwich, who had it straight from God: “All will be well, and all will be well, and all manner of things would be well.” I’d tell Meredith that, but she’d just roll her eyes at me. So I guess in the end all I’d say to her was that she made me laugh out loud on page 64. She’s a writer; she’d appreciate the praise. Melissa’s been blog-touring a bit. You can also check out her interview on Peter Salomon’s blog. And she shared some fighting-writers’-block wisdom on Joanne Rocklin’s anti-block blog. Be sure to check out Melissa Glenn Faber’s website, too. This entry was posted in Uncategorized and tagged A December Tale, Dear Anjali, Gimli, Helm's Deep, J.R. Tolkein, Julian of Norwich, Legolas, Madeleine L'Enlgle, Marilyn Sachs, Meg Murray, Melissa Glenn Haber, ruby slippers, The Brothers Lionheart, Watership Down, Your Best Friend Meredith. Bookmark the permalink. Thanks so much, Audrey and Missy, for sharing this!